Your missing tooth may cause you to feel embarrassed by the way you look or you may mistakenly believe you have to live with your gaps forever. However, dental implants can fill your gaps with functional teeth replacements that look and feel like natural teeth. Find out more about dental implants and how they can help you with Dr. Anthony Digiorno and Dr. Julianne Digiorno at Digiorno Dental Fitness with locations in Sacramento and Folsom, CA. 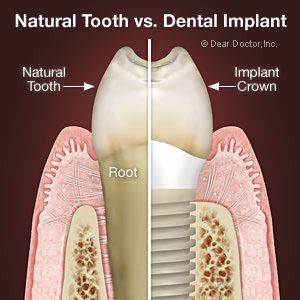 Dental implants replace a missing tooth and its root. This means that if you have a gap in your smile, implants can probably help you. Whether you are missing one, several, or all of your teeth, implants can work to fill in your gaps and give you back your smile. A single implant uses a single implant fixture, of the post which takes the place of your tooth’s root, to replace one tooth. Multiple tooth implants use one fixture on either side of a bridge to replace several teeth at once. Implant-supported dentures can replace all the teeth on an arch using four or more implant fixtures. Dental implants do more than just fill in the gaps in your smile. The implant’s fixture integrates into the bone which once housed your missing tooth’s roots. This replaces the tooth’s root and helps stimulate the bone to keep it healthy and prevent atrophy. In addition to keeping the foundation of your smile healthy, your implant replaces your tooth to boost your confidence and increase self-esteem, ensuring you can eat, speak, and laugh without second-guessing yourself. Dental implants can transform your smile and help you feel great about the way you look. However, not everyone makes a good candidate. A strong at-home oral care routine and regular dental examinations and cleanings are crucial to maintaining your implants. Though they are made to last a lifetime, implants can reject without the proper care. For more information on dental implants, please contact Dr. Anthony Digiorno and Dr. Julianne Digiorno at Digiorno Dental Fitness with locations in Sacramento and Folsom, CA. Call 916-486-8525 to schedule your appointment in Sacramento and 916-81-SMILE (76453) to schedule your appointment in Folsom today!